Seeing your dentist on a regular basis is a very important part of keeping good oral health. Your dentist does a lot more than just focus on your teeth and your gum health when examining you. Since your mouth houses living organs (teeth, gums and tongue), it’s critical that you maintain this orifice as diligently as possible. By seeing your dentist at the regular recommended intervals – typically one time every six months for most people – you can best retain your oral health and keep your gums and teeth healthy to enjoy using them for a lifetime. There are a number of different routines that your dentist will follow when providing you with your biannual checkup, a few of which this article can serve to better help you understand. There are more than 600,000 oral cancer cases diagnosed each year around the world, with more than 45 percent of them resulting in fatalities due to the late stage discovery of the cancer, according to the Oral Cancer Foundation. With early detection, however, the success rate for treatment can be as high as 80 to 90 percent. 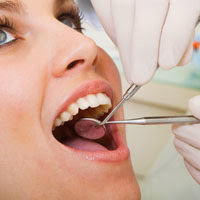 Your dentist will provide a through early cancer screening to help aid in early detection at the time of your visit. Your teeth can sometimes be difficult to assess with just a visual examination. That’s why your dentist will also rely upon more reliable radiography inspections – oral dental x-rays – to help them better ascertain the health of your teeth. X-rays can better help your doctor identify areas of decay, soft spots on teeth and areas of infection in the teeth and gums to provide effective treatment. Most dentists advise that you have your teeth cleaned once every six months. This is important because it helps preserve your gum and tooth health by removing buildups of calculus and tartar, both which can harbor bacteria and pathogens that denigrate the structural integrity of your teeth and gums. By cleaning your teeth professionally every six months, you can better preserve gum and tooth health. A dentist will provide a very thorough examination of your gums using a reference chart and checking for the measurements of the pockets of the gums by prodding them. This helps the identify any areas of the gums that are infected, diseased or that are in recession. Detection of periodontal issues at the early stages is crucial in effective treatment being administered to rectify the issue without extensive and costly, painful gum surgeries required. The greatest benefit of seeing your dentist twice per year is that you can detect and treat any found issues early and while they are still minor. Most dental issues start off as nominal issues that are ignored, and that later progress to something far more serious, far more painful and far costlier to treat later on. Remember, you only get one set of adult teeth. Make sure you are proactive in your approach to caring for them, so you can enjoy them well into your old age. Sarah Parkar is an internet marketer as well as a freelance writer. She is passionate about her work and has experience writing for a broad spectrum of topics. Parker continuously educates herself on the evolving practices of internet marketing, which is reflected in all her work. Her recent writings include benefits of biannual visits to dentist. Follow her on Twitter/Sarah_Parkar.